One of the many problems with school lunches, picnics, or eating out is the unknown germs and all round disgustingness of eating surfaces. Matkins attempts to remedy this problem, or at least cover it up with something clean! 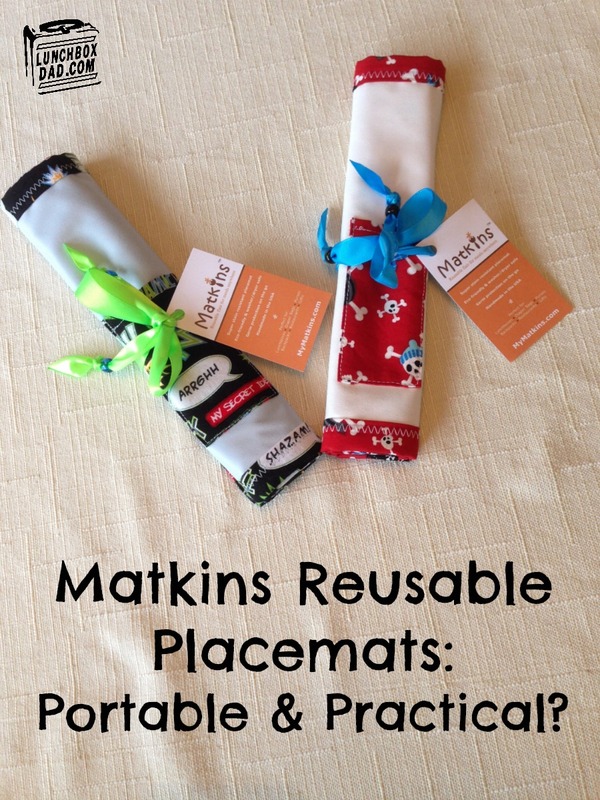 Matkins are fun and reusable placemats that kids can use to help make tables and other surfaces safer to eat on. There are a two main questions to look at with Matkins. Are they practical and are they kid proof. 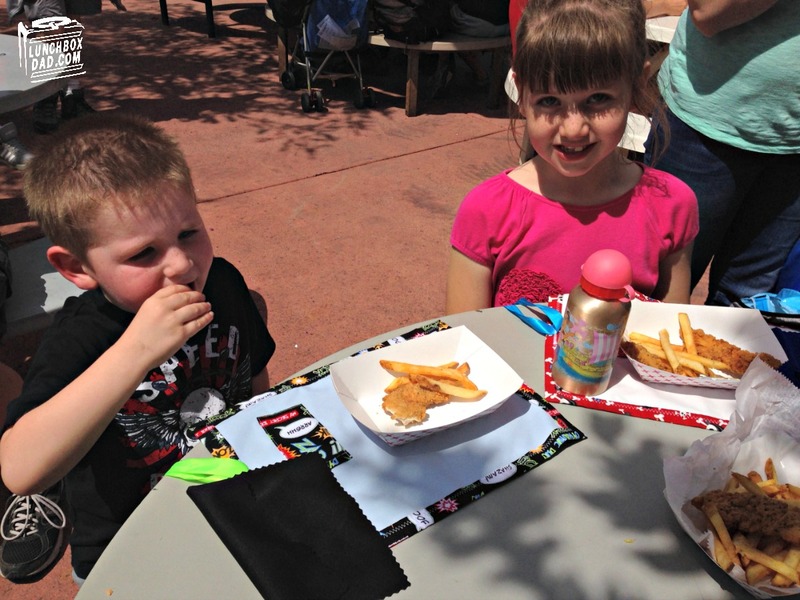 I put them to the test at the ultimate greasy germfest: an amusement park. Matkins come in many fun designs. I tested out the superhero and pirate designs. I like how they can roll up and store compactly in a bag, backpack, or lunchbox. You can use the tie strings to keep them secured. They also come with a small napkin which tucks into a little pocket. It is a little tedious to tuck it in there, but I found just rolling it up inside the Matkin works just as well. It was very easy just to unroll them before lunch at the park and set them on the table. We didn't have to wipe it off with a wet wipe like we normally do. The hardest part is remembering to put them in the bag, but since they take up such little space, you can just keep them in there all the time if you choose. The white part of the Matkin cleaned up well. 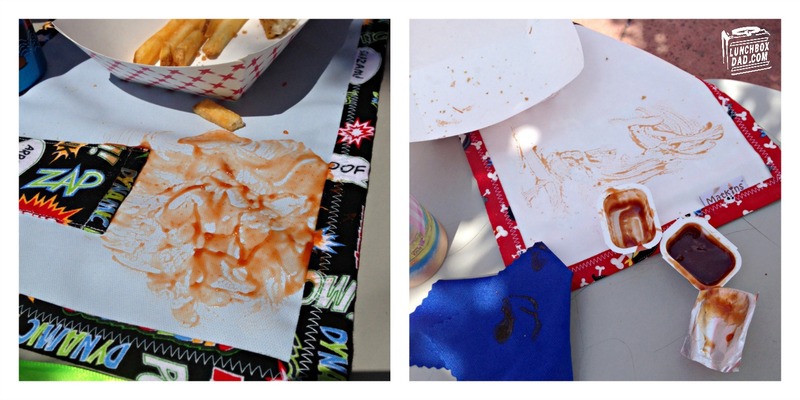 For the ketchup, I wiped it up right away and you could hardly tell it had been there. There was a light spot on the cotton border, even after going through the washing machine. With the BBQ sauce, I left it caked on to see how it would come out in the washing machine hours later. There wasn't even a mark. The verdict is that they cleaned up amazingly well and did what they promised. I do wish Matkins had a FAQ section on their website though. We couldn't find whether the placemats were machine washable but we figured they were (UPDATE: Cleaning instructions are on the back of the hang tag and they recommend drying on low heat or air dry). We did hang them to dry though because we didn't want to risk them in the dryer without knowing for sure it they would hold up. You can find out more information and buy your own set for $16 each at www.mymatkins.com. Disclosure: Matkins sent me their product to review. I have received no other compensation for this post and the opinions I’m expressing here are solely my own.